They cried out for food and God sent this dewy substance that when dried was gathered and made into food. When we speak of the Eucharist, with our brothers and sister of other faiths. 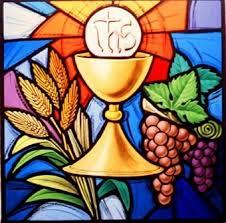 They often question us as to what the Eucharist is…What is it? We say it is Bread from Heaven, we say it is the Body and Blood of Jesus…We believe that it is really Jesus…For he offers himself as real food and real drink. “In the Eucharist, Jesus gives all. The bread is not simply a sign of his desire to become our food; the cup is not just a sign of his willingness to be our drink. Bread and wine become his body and blood in the giving. The bread, indeed, is his body given for us; the wine is his blood poured out for us. This is important because in St. John Gospel, he describe the Eucharist is the exact same terms as he does the Incarnation. And the Word became Flesh and dwelt among God. God became fully man and while remaining fully God in the person of Jesus. God came down onto this earth; he pitched his tent and dwells among us in the person of Jesus. It is interesting and important that John’s Gospel chooses to be consistent is using the word flesh and carries it through to his Chapter 6. For my flesh is true food and my blood is true drink. The other Gospels describe the Eucharistic food as his body and blood. Now there is no dispute among Christians that when John says and uses the Word became Flesh and dwelt among us that he is speaking about Jesus. It is universally accepted by all Christians that John means Jesus. It is also true that when John purposely used “the Flesh” in John Chapter 6 he means Jesus. Unless you eat my Flesh and Drink my Blood you do not have life within you. John is being consistent for a purpose, so that there may be no misunderstanding as to his meaning. Flesh means Jesus. In his real person…In the person that is both fully human and fully divine. The Eucharist itself because Jesus describes it as the gift of himself is that which is of the earth, simple bread and becomes divinity itself. In the Incarnation the Divine become Human, In the Eucharist that of the earth becomes divine. While in the Incarnation Jesus is both fully human and fully divine as the same moment, the Eucharist while remaining in the form of bread for our understanding is transformed into Christ’s own divinity. The answer is once again found in the gift of the Incarnation. The angel announces to Mary that she will conceive a child in her womb and she will name him Jesus. And the Angel says, The power of the Most High, the Holy Spirit will over shadow you. The same exact thing happens in the Eucharist…The power of the Holy Spirit overshadows the gifts. And so Father we bring you these gifts, we ask you to send the power of the Holy Spirit, that this bread and wine will become for us the Body and the Blood of Jesus Christ. The power of the Holy Spirit overshadows it. How can this be? God’s breath of the Holy Spirit breaths life into that which is inert, Bread becomes for us a living sacrifice of praise. In the Consecration…the rubric says the priest bend slightly over the gift of be consecrated and breathes the Spirit into the Gift of Bread and again in Wine. In Latin it is more dramatic. Hoc est Corpus Meium – the breath. Henri Nouwen goes one to say. Does anyone in this room have the audacity to say that God and Jesus do not have the power and capacity to give living bread to those he loves? I am the living bread come down from heaven. This entry was posted in Fr Jim. Bookmark the permalink. ← Dzien Ojca. Drogi Tato Potrzebujemy Ciebie!